Millions of Rooms Booked Since 1998! 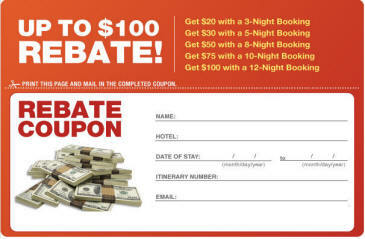 Featured Promotion - Get up to $100 in CASH BACK when you book a Las Vegas hotel with us! - Get $20 with a 3-nt stay! - Get $30 with a 5-nt stay! - Get $50 with a 8-nt stay! - Get $75 with a 10-nt stay! - Get $100 with a 12-nt stay! Get the best Vegas deals and hotel promos sent to your e-mail! Become a Facebook Fan and Get our Top Secret Vegas Deals + Win a Vegas Vacation! Visit our Vegas Talk Forum for the latest hotel specials. Registered members get access to special private deals! Just Booked Deals. View the Most Popular Recently Booked Promos! Current Hotel Deals and Promos!